Superb three-bedroom,three-bathroom residence for guests who appreciate quality! Recently renovated,this beautiful unit is one of the Tremblant resort’s top vacation homes. Guests consider themselves lucky to book this spot. 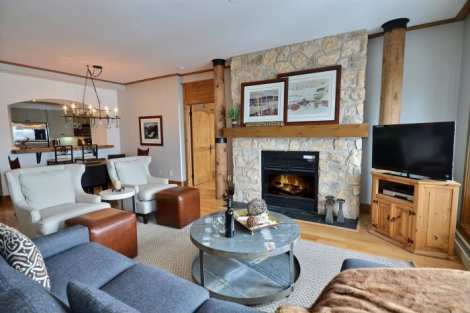 The open-concept main room, with wood-burning fireplace, comfortably accommodates visitors: in the living room,at the counter or around the dining table. The open, inviting kitchen lets you cook delicious meals as you would at home. Tastefully decorated and furnished,the living room is equipped with cable TV with DVD and a compact sound system/radio.The master bedroom has a private bath and a fireplace. The second bedroom is furnished with bunk beds, a double on the bottom and a single on top. In summer, the unit remains comfortably cool thanks to the air conditioning, while the balcony with BBQ extends the living space outdoors. A superb location for a memorable stay!